How Are the Proceeds From Mutual Funds Treated in a Tax Return? Income from mutual funds is almost always taxable. 2. What Is the Difference Between Income Dividend & Capital Gains Distributions? 3. Is a Mutual Fund a Security? Mutual funds are a low maintenance, affordable and relatively liquid investment option. While their risk factor varies depending on type -- stock, bond or money market fund -- the sheer number and range of companies in a mutual fund significantly reduces the overall risk factor. These benefits, however, do not come without a corresponding downside. Taxation is an aspect of mutual funds that can affect you whether you hold or make a decision to sell. Income you receive from mutual funds is always taxable unless the fund is part of a tax-deferred account such as an IRA or 401(k) retirement plan. In addition, income is also taxable whether you take a distribution in cash or decide instead to reinvest profits by purchasing additional fund shares. Time is another consideration, especially when it comes to taxation and capital gains distributions. It makes no difference to the IRS whether you hold a security for one year or one day but instead how long the fund held the security generating capital gains. Mutual funds generate passive income in the form of dividends, interest and capital gains distributions. Interest and dividends are distributions coming from net profit -- gross profit minus portfolio expenses -- either monthly or on a yearly basis. Capital gains distributions occur when the fund holds a security for one or more years and then sells it for a profit. IRS regulations consider any capital gains distribution you receive as long-term capital gains no matter how long you personally held the security in your portfolio. Direct income is the profit or loss you get from actively selling or exchanging mutual fund shares. Capital gains tax due depends on whether the gains are short-term -- capital gains you realize when you buy and sell or exchange a security within a one-year time period -- or long-term gains that result from selling or exchanging a security you own for one or more years. As of 2013, the tax rate for short-term capital gains can be as high as 35 percent and 15 percent for long-term capital gains. Each year in February you will receive a Form 1099-DIV from your mutual fund. This form lists dividends and interest you received during the previous year and is income you need to report. 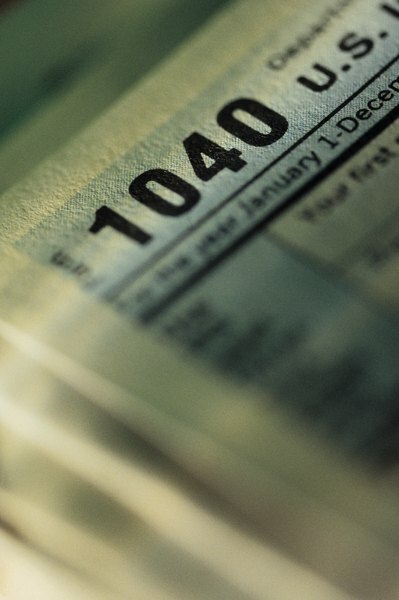 Enter capital gains -- whether passive or active -- directly into IRS Form 1040. If you realize capital gains from active selling, however, you will need to first complete Form 8949 and Schedule D before entering information into Form 1040. Schedule D is also necessary if you need to report a loss.